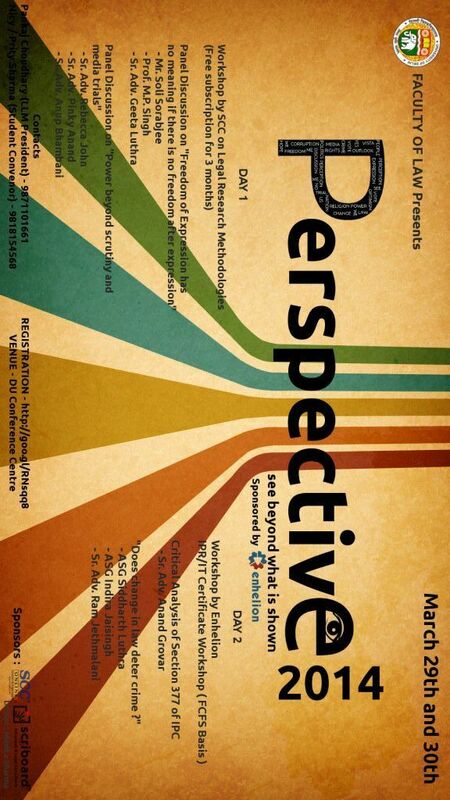 The Faculty of Law, University of Delhi is conducting a two-day academic event, “Perspective 2014″, which focuses on various issues pertaining to Law. The event is a forum that brings forth the outlook of distinguished experts of each field of law which would give us an overall view regarding the subject. It consists of Panel discussions on key topics synchronous with our times, ranging from rights of the minuscule fractions of our population, liabilities of our law-makers, etc, which consist of every individual’s run-of-the-mill interactions with law. This shall enable the participants to acquire an unbiased, all-inclusive, holistic view from all possible angles. The resource persons and the panel members invited are eminent personalities and experts of their respective fields, handpicked to achieve maximum diversity and wholeness of the dialogues initiated.